^ Braunwald E. (Editor), Heart Disease: A Textbook of Cardiovascular Medicine, Fifth Edition, p. 108, Philadelphia, W.B. Saunders Co., 1997. ISBN 978-0-7216-5666-3. ^ "2005 American Heart Association Guidelines for Cardiopulmonary Resuscitation and Emergency Cardiovascular Care - Part 8: Stabilization of the Patient With Acute Coronary Syndromes." Circulation 2005; 112: IV-89 - IV-110. ^ Burdon Sanderson J; Page, F. J. M. Experimental results relating to the rhythmical and excitatory motions of the ventricle of the frog heart. Proceedings of the Royal Society. 1878, 27 (185–189): 410–14. doi:10.1098/rspl.1878.0068. ^ Waller AD. 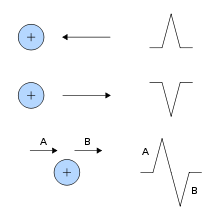 A demonstration on man of electromotive changes accompanying the heart's beat. J Physiol (Lond). 1887, 8 (5): 229–34. PMC 1485094. PMID 16991463. ^ 8.0 8.1 陳炳聖. 《萬物簡史》. 源樺. 2007. ISBN 986828421X. 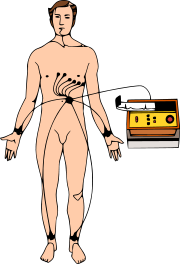 ^ Einthoven's String Electrovanometer. Pubmedcentral.nih.gov. 1927-09-29 [2009-08-15]. 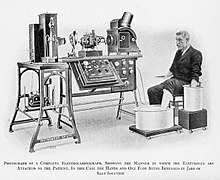 ^ Cooper J. Electrocardiography 100 years ago. Origins, pioneers, and contributors. N Engl J Med. 1986, 315 (7): 461–4. PMID 3526152. doi:10.1056/NEJM198608143150721. ^ Mark, Jonathan B. Atlas of cardiovascular monitoring. New York: Churchill Livingstone. 1998. ISBN 0443088918. ^ ECG Learning Center. Eccles Health Sciences Library University of Utah. 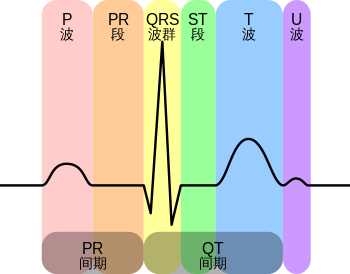 ^ AHA Diagnostic ECG Electrode Placement 互联网档案馆的存檔，存档日期2009-11-22. ^ Univ. of Maryland School of Medicine Emergency Medicine Interest Group. Davidge2.umaryland.edu. [2009-08-15]. （原始内容存档于2011-07-20）. ^ Limb Leads - ECG Lead Placement - Normal Function of the Heart - Cardiology Teaching Package - Practice Learning - Division of Nursing - The University of Nottingham. Nottingham.ac.uk. [2009-08-15]. ^ Lesson 1: The Standard 12 Lead ECG. Library.med.utah.edu. [2009-08-15]. ^ e.g. Pasco Pasport EKG Sensor PS-2111, Sciencescope ECG Sensor, etc. ^ Electrocardiogram Leads. CV Physiology. 2007-03-26 [2009-08-15]. 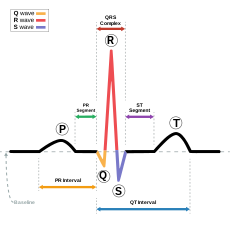 ^ Mark JB "Atlas of Cardiovascular Monitoring." p. 130. New York: Churchill Livingstone, 1998. ISBN 978-0-443-08891-9. ^ Verrier, Richard L. "Dynamic Tracking of ECG Heterogeneity to Estimate Risk of Life-threatening Arrhythmias." CIMIT Forum. September 25, 2007. ECG Lead Placement – A teaching guide "designed for student nurses who know nothing at all about Cardiology"
EKG Review: Arrhythmias – A guide to reading ECGs not written for a university biology (anatomy and physiology) course.